Today I want to talk about the DreamBaby® Bump Belt this is a really cool idea that I am very impressed with besides it being comfortable it adds safety for Mom and baby this makes sure that your seatbelt stays in place with non slip dots. My niece is pregnant and this is perfect for her and her growing belly but as I write this she is actually being induced tomorrow. This helps with the seatbelt not slipping over the bump. Recently selected for a TOP CHOICE award by the prestigious USA based Creative Child Magazine, the 2013 version of the Dreambaby® Bump Belt provides even more safety and comfort. 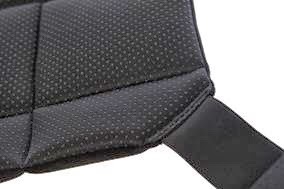 A most fabulous feature is the NON-SLIP DOTS, to further prevent the Dreambaby® Bump Belt™ and seatbelt from slipping up over your bump, ensuring your seat belt stays in place, whether you’re a driver or passenger. Car travel has its risks. All accidents and minor incidents can be a problem for anyone but if you’re pregnant it’s doubly dangerous as a seat belt can exert extreme pressure against the abdomen, potentially damaging the uterus and resulting in injury and even miscarriage. If you or the driver is forced to break suddenly or you experience a low speed impact from behind, you can be pushed forward with unforgiving force. Accident statistics confirm that unborn children can be harmed when the seat belt is positioned incorrectly over the mother’s abdomen. 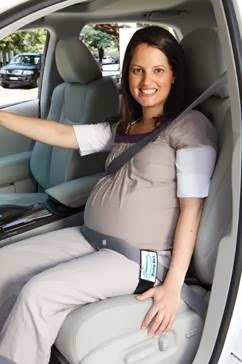 Internationally, it is now standard practice for obstetricians and GPs to advise pregnant women to wear seatbelts under their ‘baby bumps’ as opposed to across their abdomens. The addition of a Dreambaby® Bump Belt with the specially designed non-slip dot surface can certainly prevent the lap strap from riding up, therefore reducing the risk of injury to the unborn child. Furthermore tests conducted at the Qinetiq Centre for Human Sciences Impact Test Facility have demonstrated that the Bump Belt™ is effective in encouraging Mothers to position and maintain the lap portion over the hips rather than the abdomen, and effective without affecting the structural integrity of the seat belt. The new Dreambaby® Bump Belt is suitable for use for expecting mothers from two months pregnant right until the baby is born. Any pregnant momma out their should feel safe wearing this to help protect during driving!! Check them out on Facebook!!! And check out their website at Dream Baby!! Wow this is a super cool idea! I have a 8 month old and wish I had this when I was prego! I was always uneasy about the seatbelt! I will def keep in mind if we have another one and for friends!